handwriting may soon be a lost art… i hope not. here’s my humble effort to make sure that does not happen. i will make sure that i write everyday. i write. i snap. and i share what i wrote. no, not a novel… but little words, meaningful ones to inspire your day and possibly inspire some to pick up their pen even for just an hour and write just like how we did it before computers entered our homes. 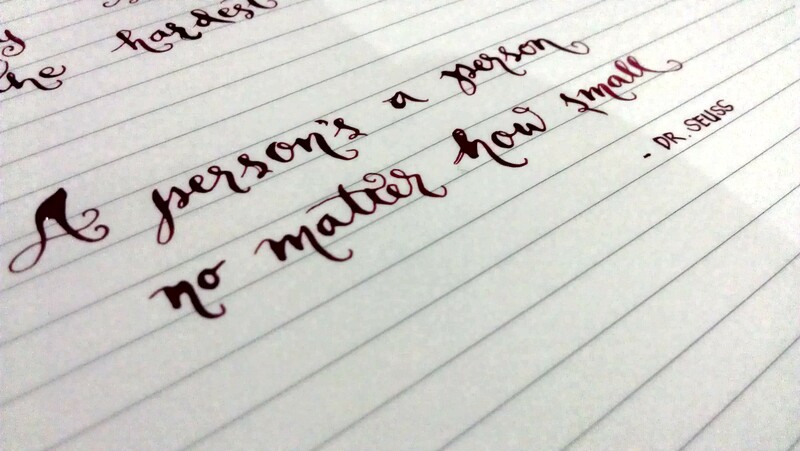 let’s start with today’s lettering practice using one of my favorite quotes from Dr Seuss. i still have to work on how to regulate the ink flow, thus the blots here and there. I am loving pointed nibs. i am happy with tachikawa no.3 and the fine nib from cretacolor. i can’t wait to try the more popular ones out there. one down… 364 to go.